Summer is always a slow time for my photography. A couple of factors come into play. The first is that Yosemite Valley in the summer is a zoo. It gets flooded by the unwashed masses in their rented RVs. Traffic and crowds are what I try to get away from, not go to. I go to Yosemite to reduce my stress level, not increase it. Another problem is that the early summer is generally a very busy time for my “day job” and this year was no exception. The California fiscal year ends in June. Every agency that has unspent IT dollars tries to ram through a bunch of last minute purchases, often just for the sake of spending the money. All of those systems end up shipping at the same time, making me a very busy person. Usually Bonnie and I try to get away to the Yosemite high country for a few days each summer but schedules made that difficult. Other than one overnight stop before the July 4th holiday I haven’t spent any time there since mid-May. I’m hoping that I’ll be able to finally break away spend some time there sometime in the next few weeks. This classic Yosemite scene was captured last February during a Gary Hart workshop that I was assisting. This spot is often referred to as Valley View or Gates of the Valley. It snowed most of the morning but was a very warm storm. By late afternoon, when this was taken, much of the snow had already melted. I setup in this spot to capture the last little bit of foreground snow on the fallen tree. The exposure was challenging. While the clouds were indeed dark, the sky behind them was very bright still. To compensate, I used a Singh-Ray 3 stop soft graduate neutral density filter. That allowed me to darken the sky without darkening the foreground. During processing I applied some dodging and burning to remove any obvious traces of the filter. With the filter in place, I set my aperture at f/11 to get a large depth of field. I used the spot meter on the patch of snow and set the camera to overexpose by 1.5 stops which gave me an exposure of 1/6th of a second at ISO 100. (When shooting snow it’s important to over exposure at least 1 stop and sometimes as much as 2 or it’ll come out grey, not white.) I was using my Canon 17-40 f/4L at 21mm. 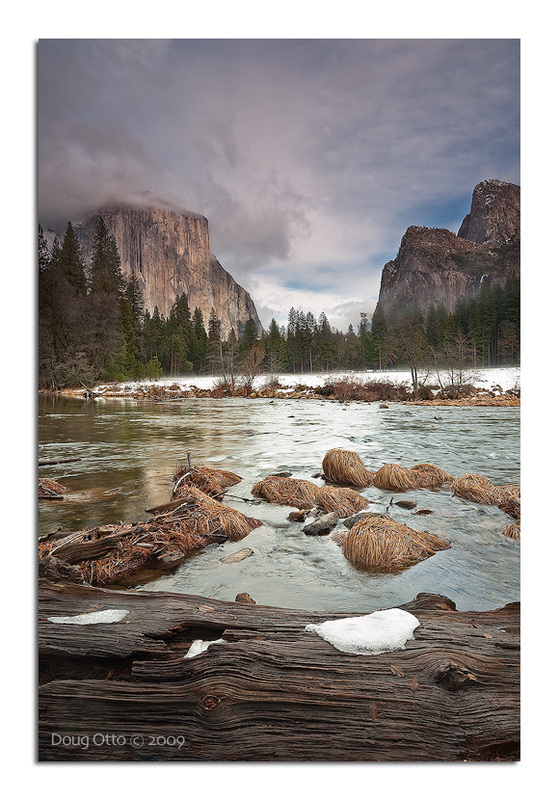 This entry was posted in Photography and tagged Canon 17-40 f/4L, Canon 5D, doug otto, el capitan, Gates of the Valley, Merced River, Photography, snow, valley view, yosemite. Bookmark the permalink.